Home phone? Or, smart phone? Risk-free 30-day return. Login to MyOoma to purchase. Use your phone wherever you are in your house – you can add up to four handsets for added convenience. Get superb sound quality, security and range for the Ooma HD3 Handset without interfering with your wifi network or other home electronics. Displays a picture of the caller as the phone starts to ring along with caller-ID information. This device also qutomatically syncs with Facebook profile pictures. Enjoy the convenience of caller-ID and call waiting at no extra charge. Download Facebook profile pictures and your online contacts from Yahoo, Google, Facebook and LinkedIn. Use the intercom to talk between handsets and transfer calls — this feature can also double as a baby monitor. View all incoming calls, outgoing calls, numbers and duration of calls. Two lines are better than one. Make or receive a second call even while another phone is in use. Perfect for a home office, choose a second number from any area code. You can ring your second number on all phones or just your Ooma HD3 handset, and you can add up to nine numbers (additional monthly fee applies). 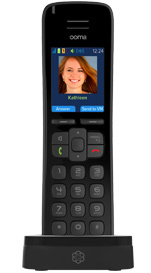 Make any Ooma HD3 handset a private extension with a password-protected voicemail account. You can also set up personal greetings, customize privacy settings, and control your voicemail notifications or forwarding.